9 attractive spaces are available for rental on the ground floor of the Pontkade building. 4 bar/restaurant spaces, 3 retail spaces (a 4th retail space has already been rented out to Albert Heijn) and 2 office spaces. Located on the NDSM-kade there are 4 spaces available with surfaces varying from approx. 200 m2 to 460 m2 (including first floor). All four spaces also include a beautiful loft. 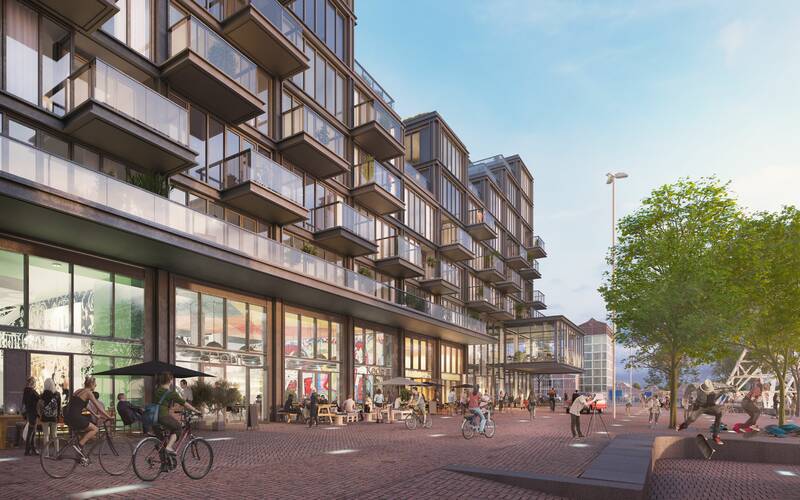 With great views over the river IJ, directly located at the ferry boat service, and the many passers-by of the wharf, this is the place for hospitality entrepreneurs to set up a strong and unique concept. It is full of events here, where a mixed audience comes to mind that ensures a constant and exciting dynamic on the wharf site. Are you or do you know a professional entrepreneur who wants to put something unique on the NDSM wharf? Let’s have coffee!